You can run MedCalc, without any feature limitations, during 15 days without registration. Note: Internet Explorer users must use the "Save as..." option offered by the browser after clicking the download link. Save the installation file onto your desktop. Next double-click the installation file on the desktop to start the installation procedure. The MedCalc installation files are suitable for new installations only as well as software updates. If you have previously installed MedCalc, you must close any open (running) copy of MedCalc first. Then execute medcalcsetup.msi and follow the instructions for the installation procedure. Anti-virus programs can sometimes interfere with the MedCalc installation process. Temporarily disabling your anti-virus program may help if you're having trouble with your installation. You should re-enable it as soon as installation has been completed. 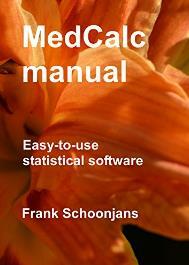 The MedCalc manual (347 pages, version 18.10) is in Adobe Acrobat PDF format. You need Acrobat Reader to be able to read this file. With the free MedCalc file viewer you can open MedCalc files (*.mc1) without the need for a MedCalc license. This file viewer has limited capabilities and will not allow to perform new statistical analyses or create new graphs.